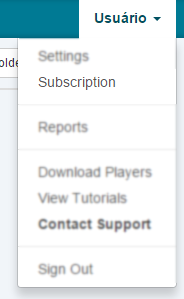 Check out all your billing history on Subscription section. OnSign TV is charged automatically on a monthly or annually basis and each payment is saved in the billing history on the Subscription section. If you need a receipt, you can download an invoice file and print it through the platform. On your OnSign TV account, click on your Username at the top right corner and then click on Subscription. Scroll down to the bottom of the page, where you will find your billing history. Find the payment you are looking for and click over it to open it on a new window. Click on Ctrl + P to print it or save it as a pdf file on your computer.